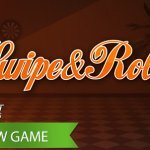 Play Jackpot 6000 for real! Looking for a typical and traditional classic slot, you have definitely found yourself one with Jackpot 6000. Just as Mega Joker and Super Nudge 6000, Jackpot 6000 can be called traditional as there are no bonus features involved like we know them from the modern video slots. A Heads and Tails game and a Supermeter is all Jackpot 6000 has to offer while winnings can go up to 6000 coins each spin. Boring? No, I can’t say traditional slots are boring at all and many players still know how to found these classic slots. Besides that a Netent Casino is just simply not complete without these old fashioned slot machines around. 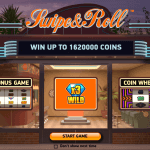 While many think the classic slots designed by Net Entertainment are based on real time slot machines, but the opposite is true. 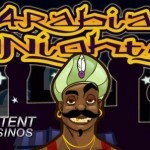 All casino games got an original design and the same goes for Jackpot 6000. That doesn’t mean they aren’t inspired by the old slot machines as you will find them in the casinos. Heads and Tails for example can be found on many of these ‘one armed bandits’, just as the Supermeter. Another detail taken over from the old fashioned slot machines are the fruit symbols, so recognisable for these games. 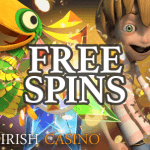 Take a seat and enjoy one of the easiest classic slots offered by the many Netent Casinos, while looking at the Gold Rush slot in the background and enjoying the few features Jackpot 6000 has to offer, although more than enough to forget about daily life, even if just for a short while. With six bet levels and two different coin values, you have enough betting options to choose from. Jackpot 6000 is only available for those players who like to play with a low risk because the minimum bet is 0.10 and the highest bet 2.00. Both available in many different currencies at the many Netent Casino providers, these bets will not be interesting for any high rollers. A shame though as I can recommend Jackpot 6000 to all type of players as the 2.00 bet can provide you a 6000 coin jackpot. While Jackpot 6000 offers you a Supermeter modus, there is only one game visible. This basic game exist of three reels with a total of five bet lines. These five bet lines will be activated when you play with a total bet of ten coins, but the lower your bet, the less bet lines will be activated. For this reason I recommend to play with a total bet of ten coins, while you can decide yourself if you want to play with a coin value of 0.10 or 0.20 of which the last one increases your bet up to the maximum bet of 2.00. While you’ve settled your bet, you can start to play and as soon as the first winnings appear, you get two choices as you can either choose to play Heads or Tails or use the Supermeter. When your first win occurs you can decide to use the Heads or Tails feature to double-up your winnings. If your guess is right, your win will be doubled, if not your wins are lost and the game goes on. If you win and wins are doubled, you could try again or you can transfer the money to the Supermeter to give the big wins a try. The Supermeter feature is optional, as you can collect wins directly after they occurred, and activated after any winning spin. This extra bonus feature will be activated when you click spin after the successful combination was made. Your winnings will be transferred to the Supermeter display at the top of the game. The Supermeter mode doubles your stake by the cost of 0.20 coins per spin. However, this extra feature gives the player the opportunity to win big when two Jokers appear anywhere on the reels. 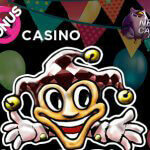 Each combination of two Jokers gives the player a mystery win of between 10 and 6000 coins. Play this feature smart and collect your wins in time to make a session on Jackpot 6000 a big success. Don’t forget that it is definitely not impossible to win the 6000 coin jackpot when you play with the maximum stake of 2.00. Three Jokers on one active bet line in the basic game and Supermeter mode is enough to cash the 6000 coin jackpot, a nice jackpot compared to other slots asking for a much higher bet for such a jackpot, and therefor one of the reasons I highly recommend Jackpot 6000 to any type of player.